This is the second of my series of crackmes although I personally think this reverseme is even more basic than the one in the first of this series. If you haven’t already, reading the first part of this series will help a lot. 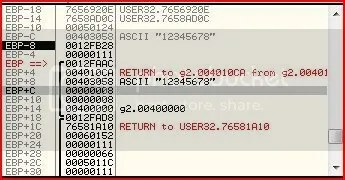 Attached to this thread is the target we are reversing today (g2.exe). So let’s jump straight into it ! First of all, let’s open up our target in Olly (F3) and run it (F9). However between our breakpoint and the compare, there are two calls. For all we know either could be setting the value of EAX ready for the compare. Once again, let’s go through the instructions step by step. 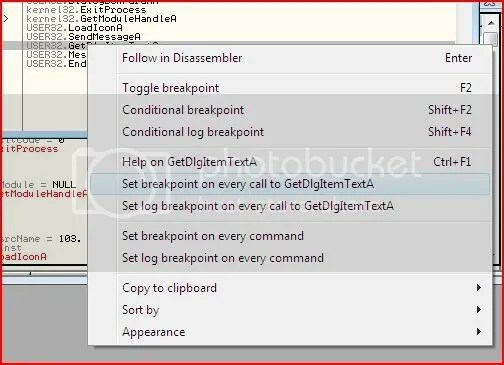 Almost every calculation in the assembly language requires the manipulation of at least one register. So most of the time when you see something like this, it means the current value of each register is being pushed onto the stack to be returned later. Between that time, we can use that register for whatever purpose we want. One important rule to always obey is that if you are to use a register, then make sure after you finish using it, whatever was stored in there originally ends up back there. However, some registers should be left well alone. For example, EIP. 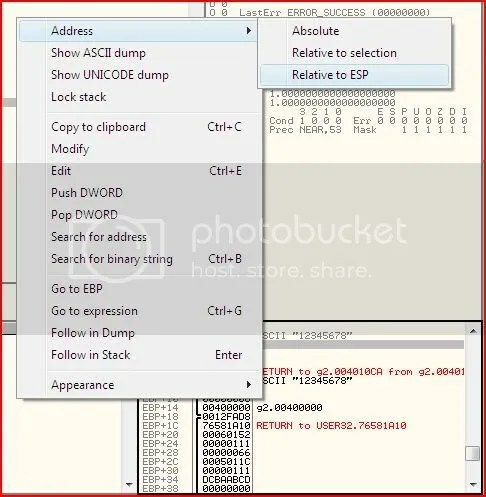 EIP holds the address of the next instruction to be executed. 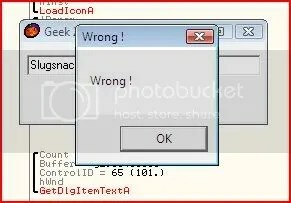 Possibly you’ve manipulated this register a little in game hacking or such but for the time being, I advise you to leave it alone. So what is happening in the four lines above is that EBP, ESI and EDI are being pushed onto the memory stack. 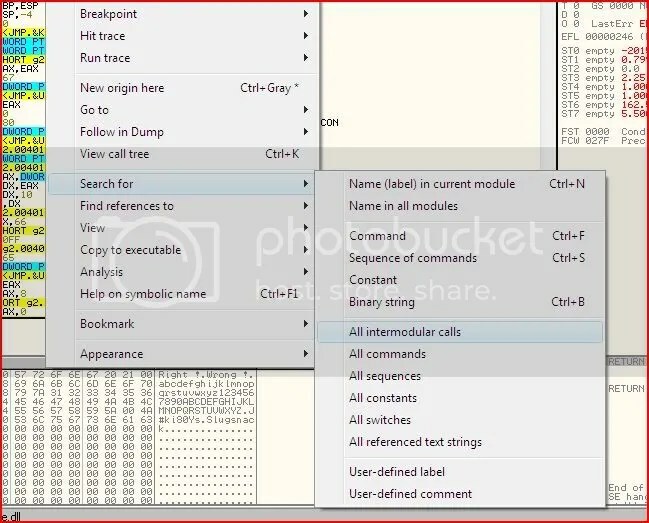 Most likely this means that these 3 registers will be manipulated later then their original values returned with the POP instruction. ESP is also moved to EBP between these instructions. 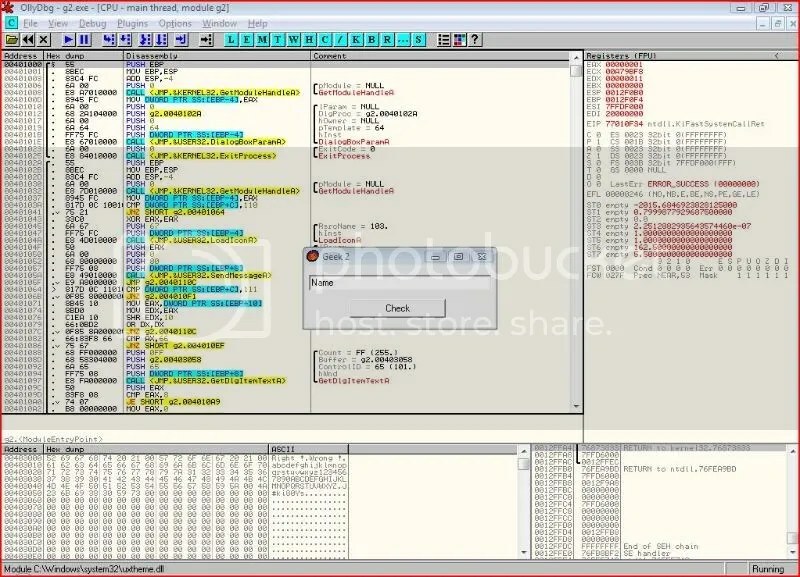 So the three XOR instructions will make the values of ECX, EAX and EBX zero. But let’s find out what EBP+8 is. Well EBP is 0012FA94, so EBP+8 is 0012FA9C. So I look that up on the stack window and you can see that that location holds our serial (12345678) which is located at the address 00403058. Now then, after this call, we hope to be able to somehow get the value of EAX to be 1. Therefore somewhere along the line we want to execute the instruction at 00401137 (MOV EAX,1). So how could we get this from the loop above ? Going to 00401142 will mean that EAX’s value stays as zero though. Therefore we need to make sure this jump is not taken at all costs. Looking at the loop, we can see that EBP never changes and its current value is 0012FA94. So EBP+C is 0012FAA0 which is 8. EsI holds our serial and EDI holds the string “BabyGeek”. 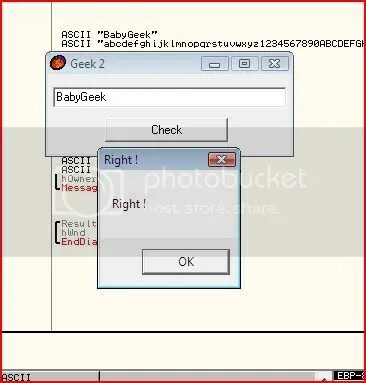 So basically each byte (character) of our serial is compared to each byte of the string “BabyGeek” and if there is no difference then we will eventually proceed to the instruction we need at 00401137 (the alteration of EAX). That all means that our serial must be equal to the string “BabyGeek”.